While many breweries have been undergoing branding changes in recent years and making the transition from bottles to cans, it's hard to think of one that's been harder to keep up with than Dainton Family Brewery. There's been new beers galore – core range and limited releases – and various new looks, additions and removals from the permanent lineup too. But, with the transition to cans now appearing to be complete, hopefully the poor little Crafty mind can be put to rest a little. Joining the Pale Ale, XSA and IPA ( a new version of what was previously the Insane Uncle IPA) in the core range is this Classic Draught. 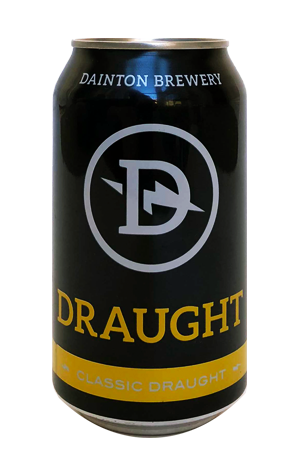 As the name suggests, it's one with its sights set outside the craftier elements of the Aussie beer community and presumably also close to Dainton's brewery home in Carrum Downs. Think European lager: floral and herbal hop aromas and soft, cracker like pale malts. There's a touch more bitterness than you'd find in macro-brewery takes on the style but nothing that's going to scare away the locals.